Why do some democratic governments succeed and others fail? In a world full of hope for democratization but wary of government failure, this book offers empirical evidence for the importance of civic community in developing successful institutions. 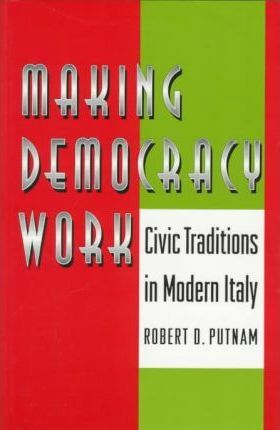 As part of a unique experiment begun in 1970 when Italy created new governments for each of its regions - regions that vary greatly from the standpoint of wealth, social structure, and political leanings - Robert Putnam and his collaborators spent two decades evaluating the performance of these governments in such fields as agriculture, housing, and health services. Their findings were surprising: regions that enjoy effective government in the 1990s have inherited a legacy of civic engagement that can be traced back to the early Middle Ages. Just as Tocqueville traveled to America to try to understand democracy, Putnam and his colleagues draw broad lessons for democratic theory from their twenty-year journey through Italy. Their conclusions challenge the simple-minded thesis of the primacy of economics and the easy optimism of social engineers. Based on dozens of case studies and thousands of interviews with politicians, community leaders, and ordinary citizens, this book illuminates patterns of associationism, trust, and cooperation that facilitate good governance and economic prosperity. It also contributes to the discussion of democracy in the newly freed lands of Eurasia and the developing world and to the gathering debate about how to revitalize democracy in America.